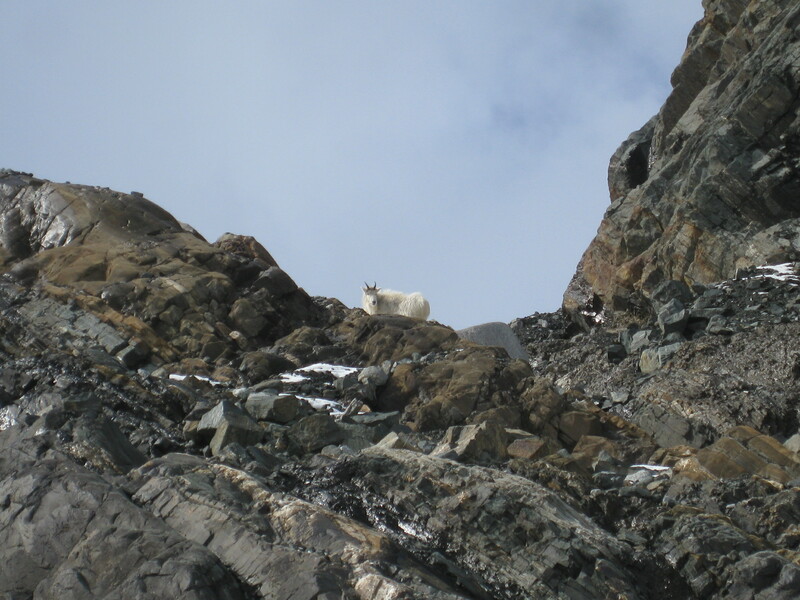 Can you spot the mountain goats? After an unexpected stop in Ketchikan to exchange a few passengers, our flight landed in Juneau about thirty minutes late on Saturday night. Couchsurfers Christy and Jason had offered to host us at their home on Douglas Island, and they picked us up at the airport in an old Subaru Outback (perfect for the conditions, which were wet and slushy at the time). We awoke on Sunday morning to snow, and an excellent view of mountains, which were surprisingly close and large, but invisible to us during the drive from the airport the previous night. 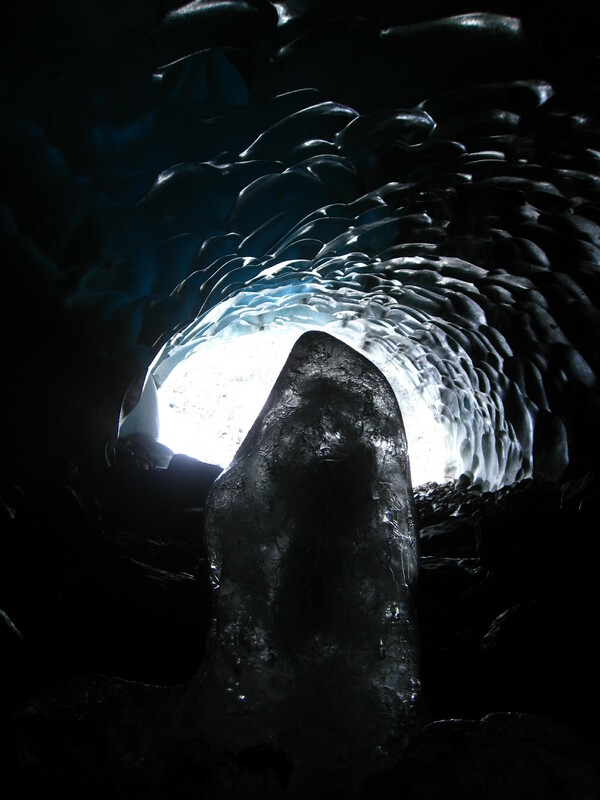 Christy and Jason offered us a variety of options for activities for our day in Juneau, and we settled on going to check out an ice cave at the Mendenhall Glacier. 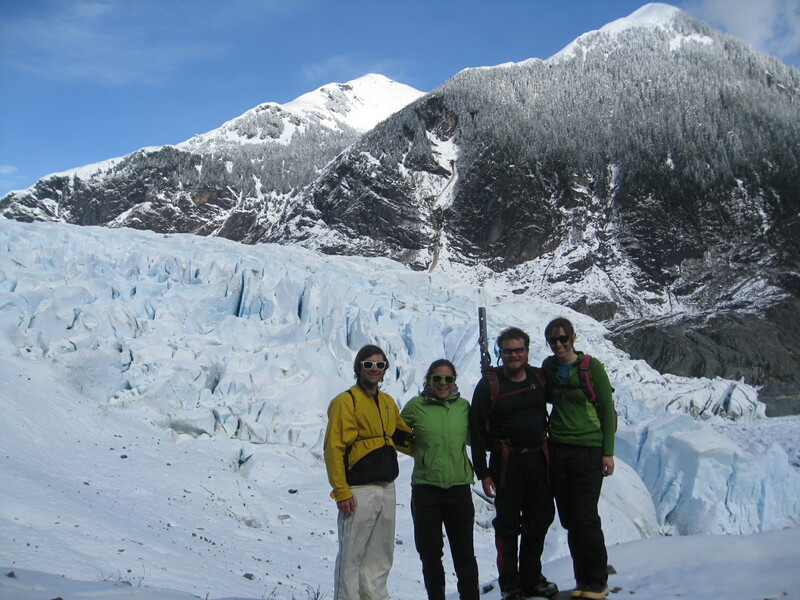 Having both worked on the trails in Denali, our hosts were excellent guides for the hike up to and around the glacier. At some point, while scrambling up a rock wall, I had wished that I bought my med-evac insurance already. 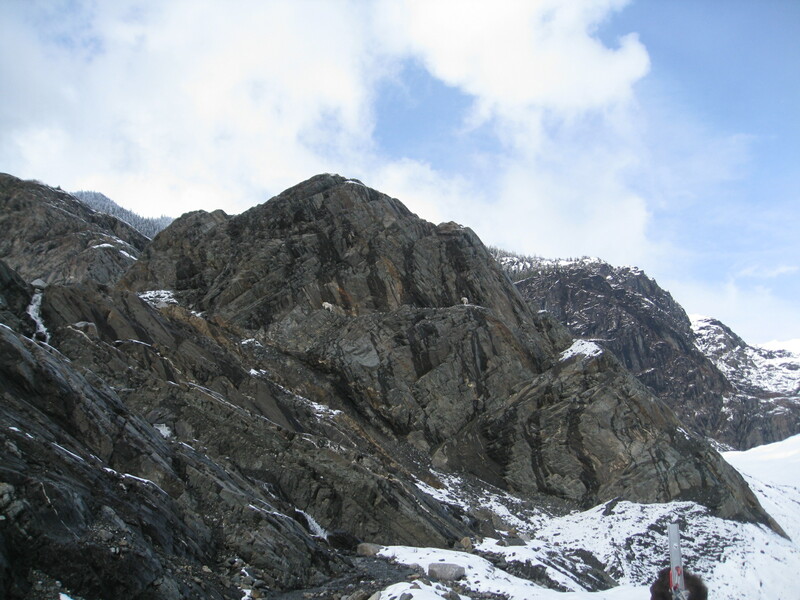 Fortunately, nobody fell into the glacier or off any cliffs. Also fortunate was the fact that we had stopped somewhere to buy waterproof rain boots on the way to the trail. The ice cave was cool (literally), but too dark inside to get any beautiful photos like the ones we had seen online before heading out there. We rested and snacked for a moment at the mouth of the cave (which is actually created by a stream that flows from the mountain into the glacier), and hiked back the long way along the shore of the fjord. The next morning, Christy and Jason drove us to the dock, where we boarded the Columbia, an enormous ferry that would take us to Haines and Skagway. Having rushed to the ferry without having time to eat, we went straight to the snack bar on the upper level of Columbia, which didn’t have many appealing options for breakfast. Twelve dollars got us some barely edible broccoli salad, an egg salad sandwich and a waxy apple turnover. No sooner had we finished our food when the captain made an announcement that there was an all-you-can-eat breakfast buffet in the dining room. Oh well. The view on the ferry was amazing for the duration of the trip, and I had aspirations of whale watching and bear-spotting from the deck – but Dallas and I couldn’t stay awake for more than a few minutes at a time to appreciate it. Posted on 30 April 2013, in Alaska, The space between and tagged Alaska, ferry, glacier, Juneau, Mendenhall. Bookmark the permalink. Leave a comment.